Now becoming CA made too easy. 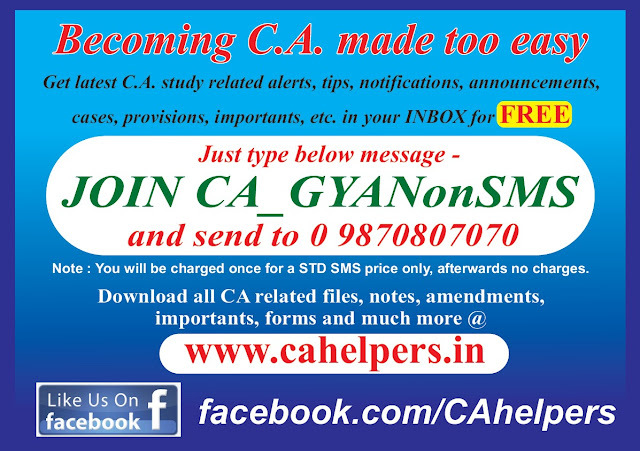 We run some SMS channels providing DAILY FREE CA study related alerts, learn on your mobile. Send all in different-different messages. You will recieve daily around 12 SMS of alerts. This is a FREE SMS alert service for which you will not have to pay anything except only for the time of registration, which is as low as Re.1 (Standard STD SMS price, free if you have national SMS pack.) It will be charged just once, afterwards it will be TOTALLY FREE. So its an investment for lifetime. Just by investing Re.1, you will get all study related alerts in your inbox for FREE. Just join all of them now.